Honing and polishing, not just grinding, are important parts of rehabbing aging concrete. While concrete is incredibly durable, nothing looks or lasts like new forever. All materials require maintenance, repair, and a little help occasionally to stay at their most beautiful and functional. When cosmetic and structural problems began to appear in concrete, there are numerous ways to address this. The process of fixing concrete involves concrete grinding, honing, and polishing. 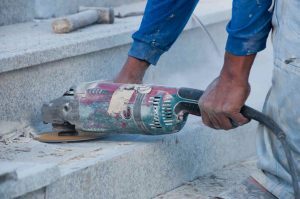 To learn more about concrete grinding and what it can do for you and your concrete, read on. Over time, constant wear on concrete can lead to numerous issues. A surface cen become uneven or otherwise irregular. Concrete grinding smooths any uneven concrete surface into a beautiful even plane. Uneven concrete is not only aesthetically unappealing, but can pose a significant safety risk. Also, an uneven concrete floor cannot be tiled, meaning that if you want to tile a concrete floor this step must be addressed first. Concrete grinding quickly and efficiently turns uneven or jagged concrete flooring into a smooth level surface. This will increase the concrete’s clarity of reflection, sheen, shine, depth, and uniformity of color and reflection. However, proper concrete grinding requires definite skill and a professional hand to accomplish perfectly. A level subfloor is an absolute must if you want to install any flooring over it that can stand the test of time and look its best without constant expensive repairs. If one attempts to build a quality floor over an uneven subfloor, they will run into a lot of frustration achieving a substandard result, then most likely have to rip out all of their work and start over after the subfloor has been levelled. Concrete grinding is not only incredibly efficient at creating a smooth and even surface, but also highly cost effective. This entry was posted on Friday, January 6th, 2017	at 2:48 pm	. Both comments and pings are currently closed.